HYRUM — Getting local residents out to take advantage of the many opportunities right here in their own backyard is the main goal of new Hyrum State Park manager, Chris Haramoto. Haramoto graduated from Utah State University and was thrilled when he was offered the job of park manager of Hyrum State Park that would bring him back to Cache Valley. He has been in the position for one month and has really enjoyed it so far. He spent the previous five years as a park ranger at Antelope Island in Syracuse, Utah. He has many goals and plans for the park and is eager to get to work. He hopes to get the local residents excited about the park and what it has to offer them. “It’s kind of an urban park where it’s not too wild for people, and it’s not a very far drive for people to come and enjoy a nice camping experience,” Haramoto said. Camping in the park is one of the biggest attractions. Motor homes, trailers, and tents are all welcome in the 60 acres that serves as the main campground. Multiple sites to choose from as well as grass, shade, and modern bathrooms make for a great camping experience. The park also offers a large camping area that is perfect for big groups and family reunions. For those who don’t wish to camp, there are two cabins that sleep up to eight people each, available for rent just beyond the campground. The cabins offer the comforts of home and great views of the dam. They were really popular during the summer, and Haramoto has plans to build more. Campers are not the only type of visitors the park attracts. Boaters, swimmers, sun bathers, fishermen, and cliff jumpers all flock to the park in summer and fall. The day-use area has multiple shaded picnic tables for individuals, couples, or families to use while enjoying a beautiful view of the dam and the scenery surrounding it. “In the fall fishing is a pretty big recreational opportunity and we’ve been getting a lot more fishermen out,” Haramoto said. Excellent fishing in the fall and ice fishing in the winter draws fishermen to the 500 acres of fresh water that is Hyrum Dam. Large-mouth bass, rainbow trout, bluegill and yellow perch are some of the species that make their homes in the dam and are available for fishermen to catch. Both fishing from boats and the shore are popular in the park. One thing Haramoto is most excited about is to start offering water equipment through a concessioneer right in the park. Currently a guest has to have their own boat or watercraft equipment if they wish to go out in the water, but that is going to change next summer. Haramoto sees the future of the park as bright and full of possibilities. He is excited to start implementing his plans and ultimately getting more local residents out to the park enjoying the peacefulness, serenity, and beauty of nature. Nice story. 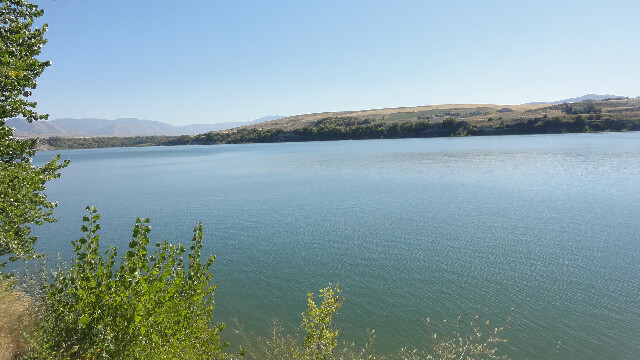 I just recently blogged about Hyrum Lake State Park on my personal and Cache Valley Visitors Bureau blogs. I went kayaking on the reservoir last weekend and took about 500 pictures. It was beautiful!